With those two informations insurance companies determine the price of insurance. This is very old school and to our knowledge no other country in the world is using this outdated pricing model anymore. Now on March 23rd, Bank Negara provided more information on detariffication in their 2015 Bank Negara Malaysia Annual Report. In their report, they provide a timeline for motor detariffication (they use the word liberalisation) with the first initiative starting in July 2016. However, this date does not mean that insurance prices will go down. The price for motor insurance is still fixed. 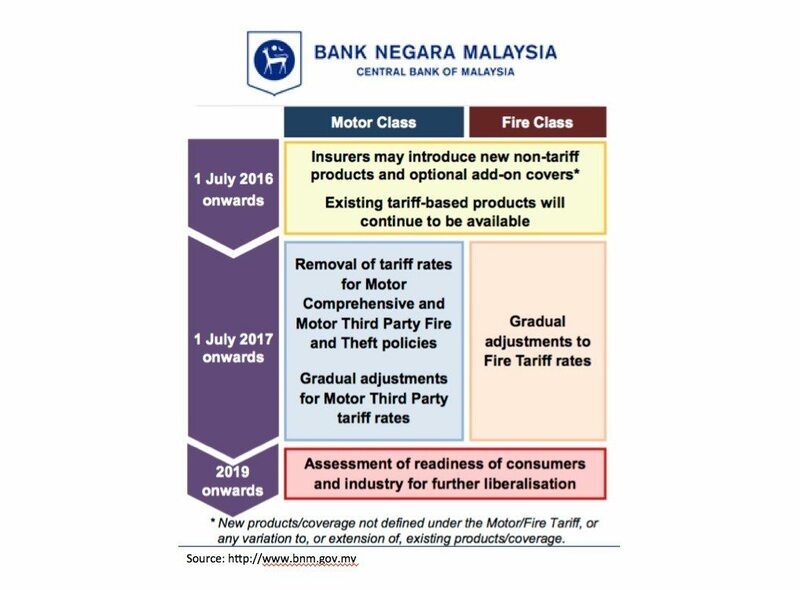 Starting from July 2016, insurer may introduce new non-tariff products and optional add-on covers. What does it mean? It basically means that they can continue with what they are doing now, because even now with approval by Bank Negara insurance companies can introduce new products. So what is the real date? It is July 2017. Look forward to this date, because car insurance will become cheaper for the drivers that drive safe and more expensive for the careless and reckless drivers. On July 2017, insurance companies can take more information about the driver, such as driver’s residence, driving behavior, etc. into consideration to determine the price of the insurance. We look forward to this date, because people with bad driving behavior will start to drive more careful to reduce their insurance price. This will reduce the risks of road accidents in Malaysia and make our roads in Malaysia safer. Roads in Malaysia will become safer with the introduction of motor detariffication. If you want to learn more about what Bank Negara has to say, check out the video on the press conference below. Also the presentation deck can be found under Briefing slides for Malaysia’s annual report. A great article can also be found on Paultan’s website in his post “Motor insurance tariffs in Malaysia to be liberalised“.